Nothing says summer more than a steaming, golden ear of sweet corn dripping with melted butter. However human consumption of corn is low on the food chain as far as uses for this valuable commodity. Let's take a journey to see how corn is used to enhance our lives. Whether it's in a can, sack, silo, or on the cob, corn is the largest agricultural crop grown in the United States, with 80 million acres devoted to growing it. If you laid out an area that size on a map, you would have an area larger than the state of New Mexico. This amount is grown within a very short period of time: the average length of sweet corn harvest is only 60 days per year in the U.S.
As an example, at one plant in Wisconsin that processes sweet corn, more than 40,000 tons of corn is processed and canned in a 60-day period. The elapsed time between the arrival of the truck and the finished product that is packed into cases is just 25 minutes. This canned corn has a shelf life of three years. In the U.S. three million tons of sweet corn is canned, frozen, and packaged annually, but this only accounts for 1% of total production. The most utilized type of corn is not our familiar sweet corn but a crop known as dent corn (so named because of the dent in each kernel), more often referred to as field corn. 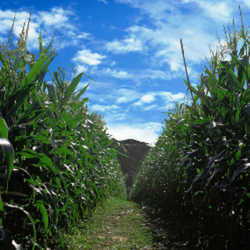 Sweet corn is best consumed with high moisture content; field corn is just the opposite, the less moisture the better. In the U.S. 13.9 billion bushels of field corn was produced in 2013 enough to provide 110 pounds for every person on the planet. 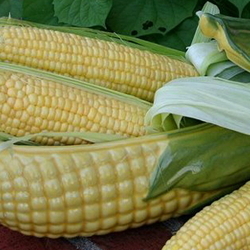 Field corn is used in more than 3,000 food products; it can be found in cereals, soda, yogurt as well as ice cream. Corn starch is used as a binder in products such as energy bars. It is also the source of high fructose corn syrup that is often added to many foods that don't really require extra sweetners. Any kind of sugar added to a food item increases calories which can contribute to added weight gain and increased chance of Type 2 diabetes, so do watch your ingredient labels. One U.S. farmer growing corn as their primary crop provides enough food and fiber for 143 people. An American icon, popcorn, according to Lois Girton PhD at Iowa State University is the oldest type of corn cultivated by man. Have you ever wondered why popcorn pops? Each kernel has a hollow core which contains a small amount of moisture. When heated the moisture turns to steam, building up pressure. When the steam reaches a high pressure and explodes it creates a "popped" kernel. A popcorn tip: store it in the freezer to maintain its freshness. 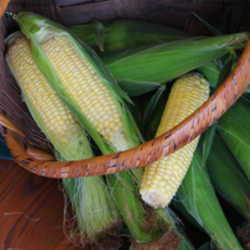 Corn is also an important ingredient in more than 400 nonfood products. It is used in charcoal briquettes, adhesives, explosives as well as drugs, both prescription and over the counter. Have you ever wondered where the "baby corn" found in Asian foods and on salads comes from? It's just regular sweet corn picked just a few days after pollination. If left alone it would mature into a regular ear of corn. Over the past decade or so, the predominant use of corn in the U.S. has been in biofuels, ethanol and biodiesel. According to the U.S. Department of Energy, biofuels reduce harmful emissions by 34%. The energy department also reported that in 2013 the 13.3 billion gallons of ethanol produce in this country reduced greenhouse gas emissions by 38 million metric tons; the equivalent of taking 8 million cars off the roads. Biofuels are made in much the same way that liquor is produced. The corn is ground and made into a mash then distilled which converts it into alcohol. Biofuel has its critics also; a report in the Toronto Star criticizes the manufacture of biofuels stating that it takes one gallon of fossil fuel to make 1.3 gallons of ethanol. It appears that the jury will be out for some time before it's determined whether or not biofuels are found to be a low cost, efficient, clean fuel. Another corn product that is being criticized widely is high fructose corn syrup. It's no secret that the obesity rate in the U.S. continues to rise on an annual basis. Many in the medical field put much of the blame on the high consumption of soft drinks containing this product. High fructose corn syrup is the sweetener used in the majority of soft drinks manufactured in the U.S. and Americans consume 15 billion gallons of soft drinks annually. Don't you think we need to step back and think about what most of us are doing to our bodies? As you can see corn is used in many ways both good and not so good. I'll leave it up to you to decide how to use this versatile plant.